Several members of the Cimarron Starlite Cruisers attended the Central Tech Car Show February 15 in Drumright. We had the opportunity to see many nice vehicles and meet some of Oklahoma’s great classic car owners. 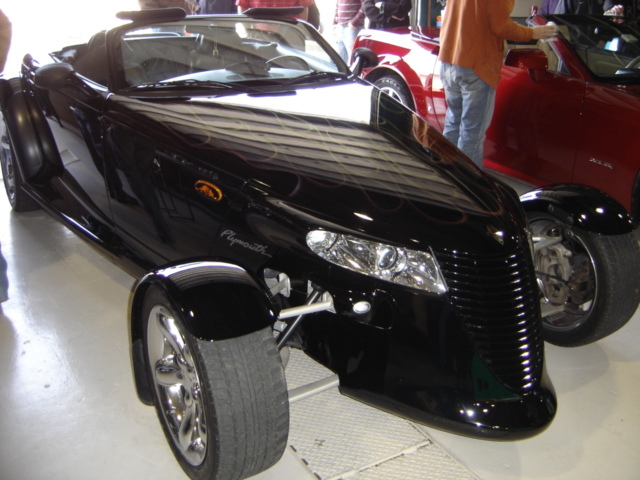 One of those owners is Robert Jones of Skiatook who brought his 2000 Plymouth Prowler to enter in the car show. The Prowler is designed to take on a '30's' look with a 50's customized make over and looks like no other modern car. Bob and his wife Leslie found the Prowler in 2007 with only 4000 original miles on this rare Chrysler product. They made a deal for the Prowler by trading a 2004 Chrysler Crossfire and a 2002 Honda GoldWing. Bob and Leslie began to change small things on the Prowler to make it theirs! The stock front bumper was removed and the turn signals were replaced with custom turn indicators that set neatly on each side beneath the head lights near the openings for the wishbone suspension. 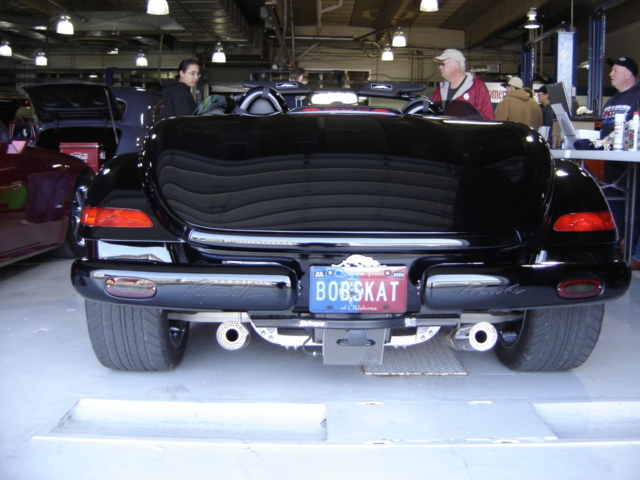 The back bumper, mud flaps and several other areas have been painted black to match the car that really gives the Prowler a custom look. The Jones also added chameleon ghost flames to the hood of the Prowler. There were only 1911 black Prowlers built. Chrysler made only a few over 11,000 Prowlers during the five years they were produced. 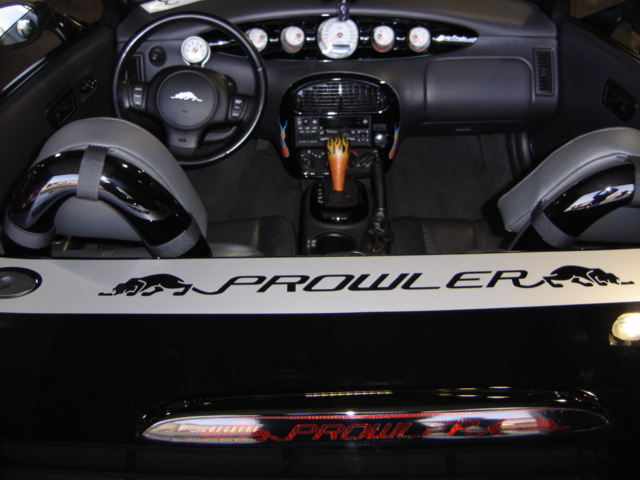 The Prowler features an aluminum 3.5-liter 24-valve sequential multi-point electronic fuel injection, 60-degree single overhead cam, all-aluminum V-6 engine that produces 253 horsepower at 6400 rpm, and 255 lb.-ft. of torque at 3950 rpm. In addition, Prowler's electronic four-speed rear-wheel drive automatic transaxle features an AutoStick® shifter that allows the driver to shift gears by simply tapping the gear lever. 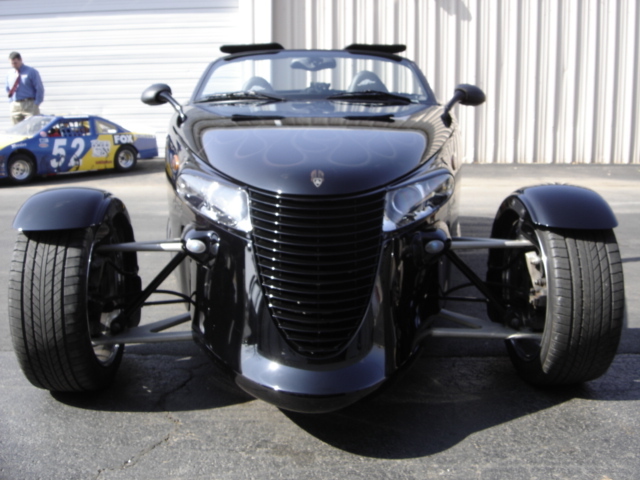 The aluminum V6, transaxle, frame and many high tech plastic body parts makes the power to weight ratio very appealing to the hot rod enthusiast due to the low 2,837 pounds that the Prowler weighs. Notice the black panels around the gages and console and the flames on the door panel inserts. The Prowler stop light adds to the custom look the Jones were looking for. 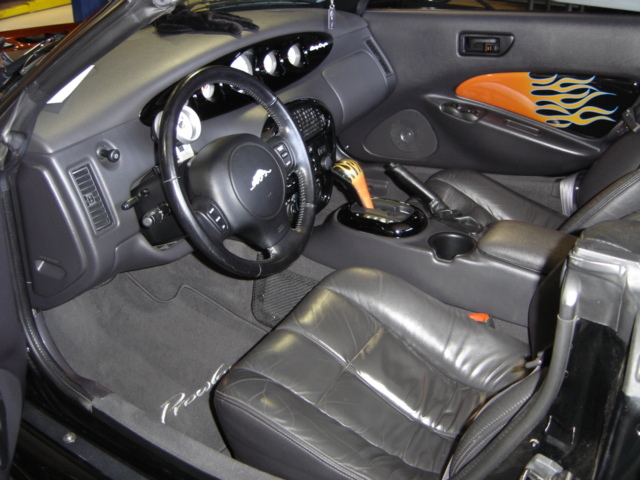 The interior features a full complement of gauges at the center of the dashboard, in an elliptical pod. That pod matched the body color, which is black. A tachometer was mounted atop the steering column, simulating the look of aftermarket speed equipment. Standard equipment included air conditioning, a tilt steering wheel, cruise control, 6-disc CD changer, and a defroster for the convertible top's glass rear window. Power windows, locks, and mirrors also are standard equipment. Four-wheel disc brakes assist the large front tires: 225/45VR17, while the back has massive 295/40VR20 tires. Both front and rear tires have run-flat capability. 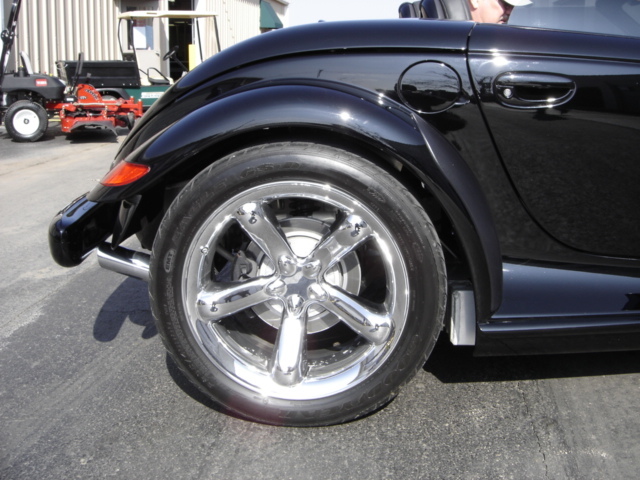 The motorcycle style front fenders turn with the front wheels which is another feature unique to the Prowler. Duel stainless steel exhaust, custom hidden trailer hitch, and transmission cooler are all features shown in this view along with of course the custom state of OKLAHOMA tag. 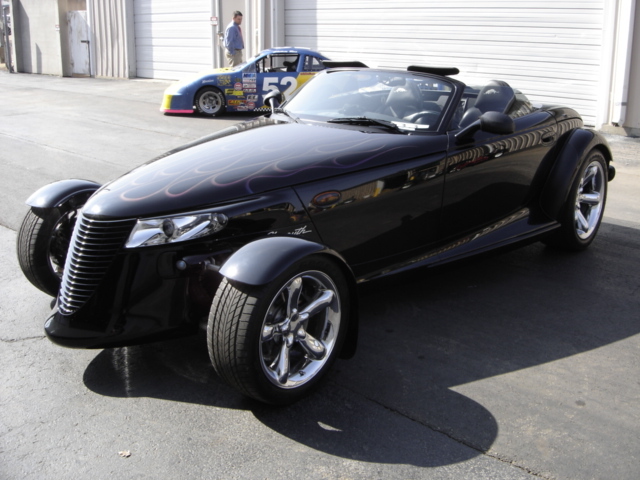 The Cimarron Starlite Cruisers' Car Club is very proud to feature this modern retro rod, Plymouth Prowler owned and customized by Robert and Leslie Jones as the Great Oklahoma Classic for February 2009. Bob and Leslie are members of the Modern Mopar Muscle Car Club. 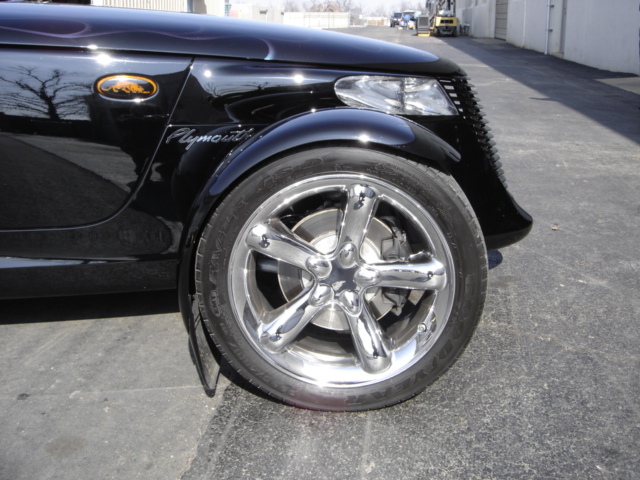 Thank YOU, Bob and Leslie, for sharing your outstanding Plymouth Prowler with us!